As summer approaches, it can be the perfect time to clean up your garden, remove weed, establish new garden beds and plants and give your garden its yearly fertiliser. Tidying up your garden cannot only help it become more attractive, but it can make it safer and healthier for you and your family. Here are X easy steps to get your garden looking spick and span for summer and the festive period. The first step to tidying up your garden is to cut down all your overgrown grasses and small plants. Not only will this neaten up your garden, but it will also make it easier to remove weeds and intrusive plants. This task is made simple by tools like line trimmers. The next most important step is to clean up large shrubs and trees. This will require a tree shear and possibly even a chainsaw. Cut large branches that are in the way or hanging over your lawn. Look for branches that could cause damage to your home or injure people and remove these. Shrubs can be fashioned into all sorts of different shapes and sizes. Take a step back and look at your garden and house as a whole and decide what shapes will look best. Once you have cleaned up your grasses and trimmed oversized trees and shrubs, it’s best to remove large debris and waste. Start at one side of your garden and work through it methodically, removing unsightly boulders, rocks, sticks and rubbish. 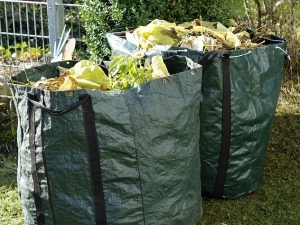 By the end of your clean up, it’s likely you will have a huge pile of green waste, possibly more than you can manage to fit in your household garden bin. If this is the case, professional rubbish removers like 1300Rubbish can safely and responsibly dispose of your rubbish. Now that your garden is looking clean and free of debris and garbage, you can begin tending to the plants you want to keep. Just before summer starts to heat up, it’s a great time to fertilise your garden, giving it the nutrients it needs to flourish through the summer. Vegetable gardens should be a staple of anyone’s garden. Not only do many vegetable plants look great, they can provide you with fresh and healthy veggies. It doesn’t matter how much space you have. Even with limited space, such as a window sill, you can grow an assortment of herbs. With summer coming up, it’s the perfect time to start growing summer, salad vegetables like tomato, snowpeas, capsicum or chilli, lettuce, cucumber, basil, rocket and parsley. Similarly, it’s a great time to update your garden, removing anything that’s old or dying and adding just about any type of plant. Early spring and summer are perfect for anything from trees to shrubs and flowers. Prepare for new plants by clearing garden beds of grasses and weeds. When making room for new plants, it’s important to understand how much space they need to grow, both sideways and upwards. Generally, this information is provided on the labels that come with plants, or simply search online for plant guides. Your garden can be the perfect place to relax and have fun with your family. However, without proper maintenance, your garden can become untidy, disorganised and potentially unsafe. It can be a huge job but by following these steps you can methodically work towards a tidy, safer, more enjoyable garden.